This is not a blog post about choosing thoughtful gifts, this is a blog post about how give knitted gifts thoughtfully. I am not talking about you deciding if giving a hat or mittens or a cowl – I am talking about how to give a knitted gift in a way that you and the recipient get the most out of it. I have made different experiences with knitted gifts. As mentioned before, I do like to bestow knitted gifts onto worthy recipients. I do enjoy knitting for others, but when I am done I want to be sure that my work is appreciated. It is way more satisfying that way. For the knitter and the giftee. So, make it easy on yourself and the clueless, non-knitting recipient. Tell them how to treat your work, so it will last longer than one wash in the machine or toss in the dryer – accidentally or not. Tell them that ‘hand wash’ does not mean hours of rinsing soapy suds from wet woolly things, but minutes of TLC if using a no rinse wash. Tell them that even though “Woolite” has the word wool in the name it is not necessarily the best solution for their hand knit woollies. Tell them that if they want to enjoy the gift for a long while they should take good care of them – and, most importantly of all, tell them how. And yes, these and a variety of other tags of this kind are available at the store! I, for one, like to use gift tags to do exactly that. 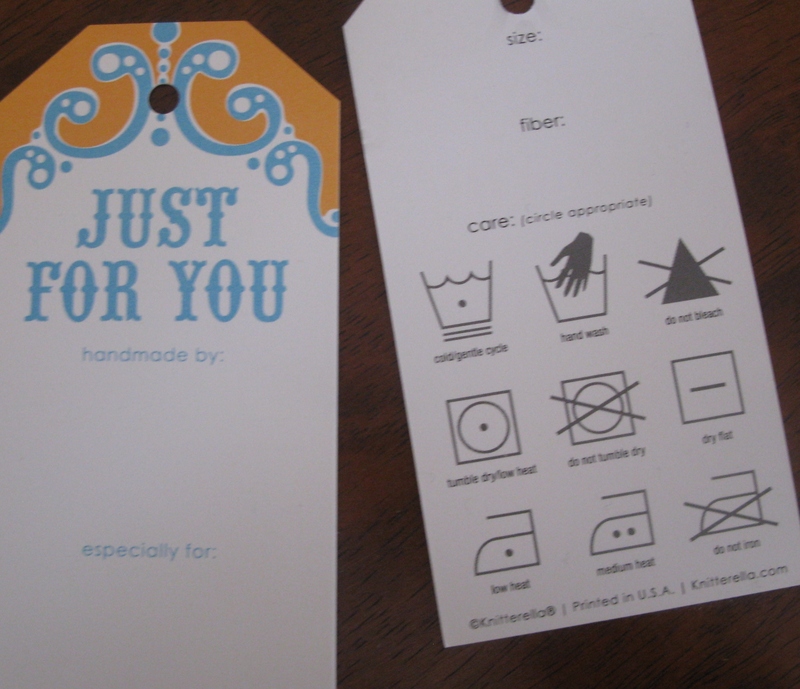 Like a label in clothes they have the care instructions printed on the back, and you only have to circle the appropriate ones. I also usually add a sample of no rinse soap in the mix, with the explanation how to do it, if it is not already written on the sample itself. This applies only if you did not use superwash yarn, meaning yarn that is not suitable for machine washing.